Just because it’s old does not make it an antique. According to U.S. Customs Laws on antiques, they are “any work of art, piece of furniture, decorative object, or the like created and produced in a former period, 100 years before date of purchase.” However, with automobiles an antique or classic car is only 25 years or older. But again, value is not based upon age. Value is derived supply vs. demand and desirability. If you have a supply of 10 antique “widgets” but only 2 buyers, the fair market value is low. Take those same 10 widgets and find 50 or 60 ready, willing and able buyers and the value increases. So this item, in the same condition can have several different value ranges based upon a specific point in time. When it comes time to put your treasures up for auction make sure to not clean them. Although you may think it will increase the value, quite often it has the opposite effect, hurting the value; this is especially true with metals of any kind or wooden furniture. True collectors and experts (which most of us are not) want this aged look with its natural patina. Many times unscrupulous people who create replicas, in an effort to deceive collectors, will leave the reproductions outside, in the elements and dirty them all to create the patina that collectors desire. One other important thing to remember is to never apply polishes; ever! If you need to clean an item, make sure to use a dry terry cloth and take care to not scratch the surface. A mild, “No More Tears” type of soap maybe used, again with a soft rag; gently wipe the surface making sure not to scrub. Most importantly…When in doubt, leave it alone! 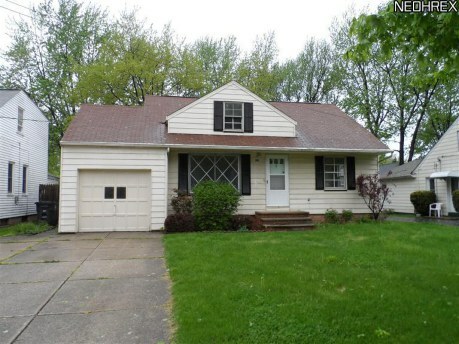 This cute home can be yours today! Here’s a fantastic opportunity for anyone looking to move! 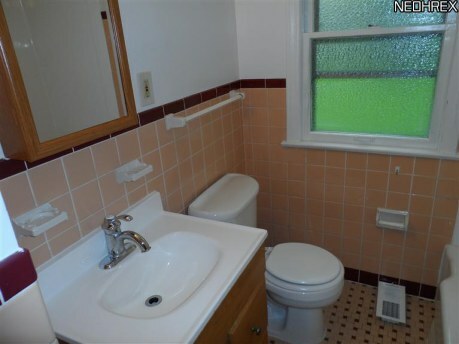 This home is in great condition and has been recently remodeled. 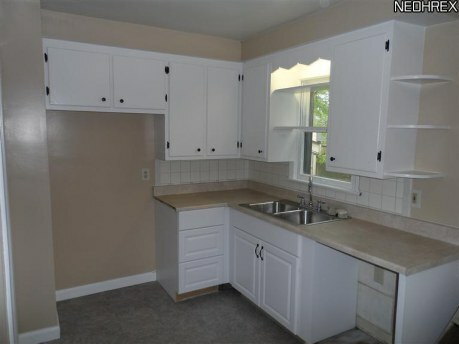 The brand-new kitchen is super cute and ready for your next culinary adventure! 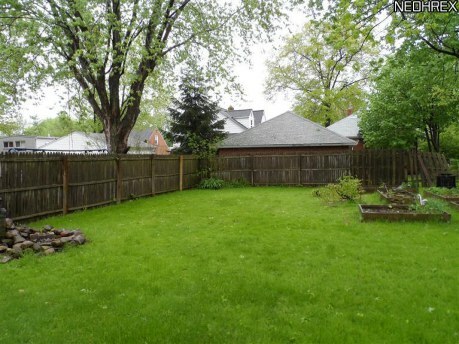 The fenced in back yard is not only private, but offers you a private oasis from the hustle and bustle of the big city! Perfect back yard for relaxing! 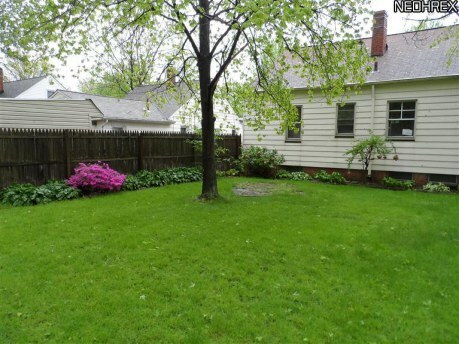 Flowers and trees await you in your own private, fenced in back yard! One thing that we, those of us working in the real estate business, do is help people find a place to move to. But one of our staffers recently moved, a complete relocation to the Akron area. This afforded a unique opportunity, how to help someone find their way in a new city. There were many ideas given and here are some of them. 1. Go out and try local restaurants – This is a great way to see what your new area has to offer, food-wise. You’d be surprised to see what you can find by just driving around. In the Akron area you find most anything you could think of; Indian, Chinese, Japanese, Thai, Mexican, French, Italian, African, etc. Unless you go out and try to find these places, or search for them on an app like Urbanspoon, you wouldn’t know about them. And it gives you a great opportunity to meet new people, you never know who you’ll meet at that little Indian restaurant! 2. Visit the parks – If you live in an area that is filled with parks, this is a fantastic way to see your new surroundings. It’s also a way to find a spot where you can go and just get away from the stresses of daily life, to find that quiet place! 3. Find museums – Museums are an amazing place to learn more about your area. Don’t think so? Most cities have some kind of museum about its history, but not every area can support things like an art museum, or a fashion museum. What kinds of museums your area has depends on the atmosphere and kinds of people who visit it. The more diverse the museums, the more diverse the community. 4. Do research online – Read up on your new area. When are festivals? What are the popular spots to go to? Is there anything newsworthy happening? 5. Meet your neighbors – Go and introduce yourself! 6. See what sporting events are available – Any baseball, football, soccer, basketball teams? Go attend a game! It’s been rainy lately in Northeast Ohio. We just ended our streak of 16 straight days of rain! Now that it’s the weekend, and it’s going to be sunny, we’re planning out going out and making the most of it! What are your plans for this sunny weekend!! Granite Counter Tops: Big Selling Feature, but Bad for Your Health? Granite is radioactive, but how much so? Over the years granite countertops have become a huge selling point for homes, often adding thousands of dollars to the listing price and value of a home. But over the last couple of years, many people have begun to sound the alarm about the possible amounts of radiation homeowners can be exposed to. Before we talk about the possible dangers, let’s put on our geology hats and learn more about granite; this is important to understand why people are concerned about it. Granite is an igneous rock, formed by heat and pressure deep within the earth. After millions or billions of years, eventually gets squeezed up towards the earth’s surface where it can be mined. The earth’s core and deeper levels are filled with radiation, and being formed in those depths, granite is exposed to and absorbs it. Now we need our chemistry hats. As granite forms it is exposed to uranium, which is used for nuclear power plants and bombs, so you know it’s dangerous. As uranium degrades it releases a gas called radon. Radon is considered a carcinogen and has been linked to lung cancer and several other forms of cancer. Radon is all around us, the dirt our homes are built on or in contains it and the air is filled with it as well, we can’t escape it. Usually radon is found in homes in basements, where the dirt that contains it surrounds it. Most granite countertops radiate 4 picocuries of radiation per day, which is about as much as we come into contact with on a daily basis. There have been reports of some granite radiating 100 picocuries per day, which is on the dangerous side. But all of this talk of “danger” deals with how much time you spend at your counters. If you live around them and spend a lot of time, then feel free to have them tested for radon levels. But mostly, you shouldn’t worry. The amount of radon you are exposed to over a year is equal to smoking half a pack of cigarettes. Is there a danger? Only if you spend every minute of your 24 hour day living on your granite countertops. Even then, the “danger” is minimal. Your best bet? Just leave them in and not worry. The 4th of July is a time to celebrate our country’s Declaration of Independence, but it’s also time to celebrate with friends and family. Also, it’s time for fireworks; lots and lots of fireworks!! Here’s a list of firework displays in the Northeast Ohio area. And when you’re ready to declare your independence from your current home, contact us for help in selling and buying a home! Why You Should Trust Us for Property Management. In earlier blog posts we explained how property management works and then why you should choose us, The Real Estate Solutions Team, for your real estate needs. Now we explain how we are different than other property management firms and why you should choose us for your property management needs. We have a team of extremely qualified and dedicated property managers who come backed with years of experience. Along with a dedicated office to ensure your investment work for you, rather than you working for it. We offer peace of mind! 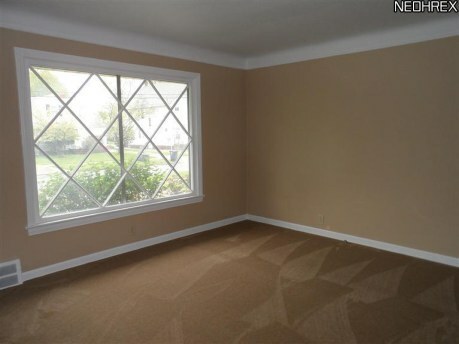 We conduct a rental market analysis to establish your property’s fair market value. Also, we offer a survey of recommended repairs to ensure that your property is ready to be rented and ready to make you as much income as possible from your investment. We market your property in both traditional and new ways. On the traditional side we list your property on the MLS, exposing it to millions of agents across the country, along with putting your property on national rental sites. Our new marketing strategy includes listing your property on Craigslist and promoting it through social media, such as Facebook, Twitter, Pinterest, WordPress, Active Rain and Tumblr. Our leases and legal documents are written by our real estate attorneys and come backed with years fo tenant-landlord experience and comply with all state and federal laws. Ensuring that you have legal protection. We handle all maintenance requests from your tenants, to make sure that all needs are addressed. Also, we can coordinate with vendors from our wide network of reasonably priced contractors and service people. We use a strict and comprehensive screening process for our owners. Our screening process includes: national criminal background check, credit reporting, nation eviction background and income verification. Guaranteeing that only qualified tenants can rent from you. Our firm rent collection policy is to take quick action to protect our homeowners’ interest. If delinquencies occur and an eviction is nescessary, our management and legal teams can handle all aspects of this process on the homeowner’s behalf. Our accounting and record keeping software is custom designed for accuracy and efficiency. Owners receive monthly statements detailing profit and expenses for the property. We also provide year-end statements for convenient income tax accounting. We offer peace of mind for investors. Contact us today to learn more or to utilize our services for your needs! Why Buyers Should Seek Pre-approval Before Looking for a Home. Searching for a new home can be a tricky and time consuming process, realtors, like those at The Real Estate Solutions Team, can help you navigate through it. But there are things buyers can do to help speed up the process, such as seeking pre-approval for their mortgage. For one thing, it speeds up the process. When you seek pre-approval the bank or lender tells you how much you can spend, giving you a price range to work within. Without this, you might be looking at home you can’t afford and then you’d have to start the process over again. Secondly, it speeds up the time from finding a home to when you want to close on it. Because all of the paperwork is done, once you find a home you can just notify the lender and start the closing process quickly. With homes selling faster because of the rebounding market, make sure you get the home you want before someone else gets it first! Let’s Give Thanks for our Fathers This Weekend! Father’s Day is tomorrow, a day we set aside for the father figures in our lives to give thanks for all they have done. Some celebrate their fathers by giving them the day off, maybe buying them gifts or doing something special. So tell us, what do you plan to do for the father in your life? BTW! Here’s a photo of the father of one of our staffers! We call ourselves The Real Estate Solutions Team, what does that mean? We can ensure that you find the home of your dreams. How? We will walk you through the pre-approval process. Show you homes that you want to see and do everything we can to help you get the home you want. Our agents are local experts, living in the areas they serve and can assist with any needs you might have. Not only do you have our agents to help you sell, we have an extensive marketing strategy to help your home sell quickly; this includes social media, print marketing and online marketing, more than just the old yard sign. If you decide that selling isn’t right for you but no longer need your property, we can help you lease it to someone, giving you extra income. We can help you with a lease-to-own plan, where the tenant pays rent that is then used down the road to help purchase the home. Want to invest in real estate? Already an investor and want to make your life easier? We can help! Our property management team handles all the hard work for you. We screen each applicant, conducting criminal background checks, credit checks, nation-wide eviction check and income verification; that way you lease to only qualified tenants. Our property management division also takes care of all the accounting, providing monthly and year-end statements, and we handle all the repairs and maintenance that might be needed during the rental. Peace of mind, the most important thing in real estate. We also provide these services to people leasing a home or doing a lease-to-own. Alson on our team is an auctioneer, who can help you sell your home quickly, usually within 30 days after signing the contract! This a viable solution for people who need to sell a property promptly. Auctions have motived buyers on premises who want to buy that day! We truly are The Real Estate Solutions Team. We can help you with anything in real estate and provide solutions to any problem.